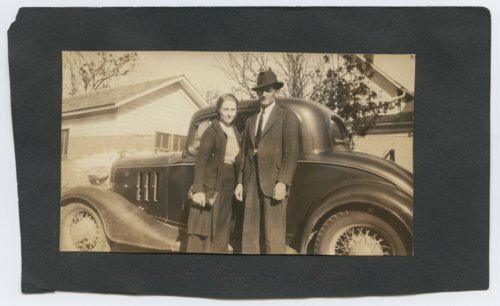 This is a photograph of Chester Dale George and Mildred Mae Jolitz George with their automobile in Manhattan, Kansas. They were married on August 31, 1935 and had three sons Gerald, Gene, and Philip. Chester had various jobs including teaching, sales, and working for the Boy Scouts. Chester died on May 26, 1994 and Mildred died on January 12, 1996. A stone in their memory is in the Prairiedale Cemetery outside Talmage, Kansas.